Arizona's Best TV & Audio Mounting Installation Experts! Trust your local TV, Surround and Home Theater Experts! We do it all. If your looking to hang Flat TV's or Surround Sound Systems for your home or business, give us a call today! Are you looking for someone reliable and affordable you can trust to hang your flat screen tv or surround sound speakers? Do you need someone that can wire your tv and audio cables so your place looks clean and tidy? Look no further. We are Arizona's Best TV & Audio Mounting Experts! Just buy new speakers for your home theater system? Or maybe you have existing speakers that need a professional installation? Whatever the case, we are your go to experts for speaker installation and wiring. We take the hassle out of setting up your speakers. We know how to perfectly align and calibrate every home theater setup for the perfect acoustics and sounds. We are capable of running all the necessary speaker wiring and outlets needs to make your surround sound speakers look clean and nice on your walls, ceiling and TV stands. Trust no one else except TV Audio Mounting & Installation! OK so you bought all the parts for your home theater setup: speakers, AV units, wiring, flat TV, etc. The issue now is - how do you install it? Leave that task to us. We have done hundred of surround sound installations. We know exactly how to wire and setup any brand of speaker and AV units. Is your house not wired for surround sound? No problem! We can also wire all the necessary cabling needed plus add the wall sockets, outlets and brackets need to power and hold your speakers. How cool is that? So, look no further for your Surround Sound System needs. We are here to get things working quickly and promptly so you can enjoy your personal home theater experience! Need your TV Projector installed in Arizona? Are you in Gilbert, Mesa, Chandler, Scottsdale, Phoenix or anywhere in the Valley? Prefect. WE CAN HELP! We are experts at all video projectors and brands. We know how to wire and hang your projector to the perfect distance and viewing perfection so your maximizing on every single pixel and getting the maximum HD experience. Trust us, you want the best when it comes to projection installs. We also are experts at helping you choose and find projections screens and installing them your liking. We hang them and also maximize their used in conjunction with your video projector to ensure you have the best viewing experience possible. So give us a call today to get your Home Theater Projector installed and mounted or request a free estimate online! Own a business in Arizona and need Flat TV's hung? No problem. We specialize in working with business owners and commercial buildings in wiring and properly hanging TV's to satisfy your customers or employees. We have over 15 years of experience setting up businesses with TV and Sound solutions in Arizona. We also specialize in wiring you business with the necessary TV solutions, especially when it comes to Bars and Restaurants. If you run these types of business, you will realize that when the customer has TV to watch (generally a sports game to watch - whether that's football, basketball, baseball, hockey, NASCAR or whatever - it keeps the customer longer in your bar or restaurant and in turn the customer orders more food and drinks, which results in more money generated for your business. We recommend DIRECTV service, as the leader in sports programming for all commercial and business TV installs, as it gives the biggest and best selection of sports, offering almost every game available, plus the NFL Sunday Ticket which allows your customers to watch every NFL game on Sundays. Contact us for all your businesses TV Mounting and Service needs. We are your commercial TV & Audio experts! Why Choose Audio Mounting & Installation? We realize that getting your home or business entertainment needs set up correctly and professionally is your top priority. We want you to feel confident and comfortable knowing that we are experts in all things Audio and Video. The biggest mistake that people make is getting heir Audio and Video needs done through 'big box stores' like Best Buy or others. Not only are they expensive but they sound out college and sometimes high school kids who are handling and hanging your really expensive Televisions or Surround Sound systems. We think this is very risky, especially when handling your equipment but also in getting everything powered and wired correctly to how you envision your Home Entertainment needs. With over 20 years of experience in the TV industry and specializing in all things Mounting, Wiring, Surround Systems, Speakers, Televisions, Projectors you name it - We are your Home Theater Experts! What are you waiting for? Give us a call today @ 480-470-1738 or request an estimate online above! When it comes to installing a quality wall mount for your Television, look no further. We are Gilbert Arizona's best wall mounting experts. We also hang wall mounts in Chandler, Mesa, Phoenix, Tempe Glendale and the entire Arizona Valley. We only use the best and highest quality TV mounts in the industry. So if you need a strong and sturdy TV mount, be sure to contact us through phone or through our online estimate form. 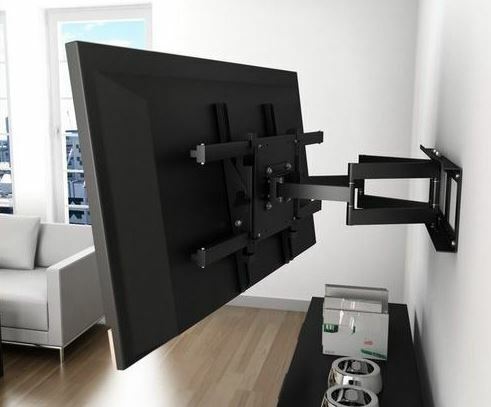 Having a wall mount TV is critical for hanging your television safely and effectively. When we hang your TV mount on the wall, we make sure we are always mounting it to sturdy studs, in most cases behind drywall. We use strong steel screws and bolts with all of our brackets to ensure your TV will stay snug firmly and safely for the life of the time its hanging at your home or place of business. Listen. We realize nothing is cooler than having your awesome new flat screen TV hanging up in your house. It is absolutely an awesome sight. But we also don't want you dropping your TV and breaking it or attempting to hang it and it ends up being lopsided. That would be bad, and your family ad friends would be greatly disappointed...and so would we! So, whether you live in Gilbert, Chandler, Mesa, Queen Creek, San Tan Valley, Apache Junction, Phoenix, Scottsdale or wherever n the Arizona Valley - please call us to install your flat screen TV. We are experts at TV Mounting Brackets and TV Wall Installations and Hangings. We want you to sit back and relax as we safely and properly hang your TV and secure it the correct way with the right tools and hardware to ensure a solid and level installation. Please request an estimate from us today or give us a call. So you bought a new AV Unit. Awesome. AV units are what power your surround sound setup. You know, the speakers and sub-woofers that create that amazing Theater feel. But let's be honest. AV units can sometimes be quite complicated in configuring, wiring and setting up to your perfect needs. If you need some help installing your AV unit in Arizona or in Gilbert or anywhere in the valley, please give us a call. We know all AV unit brands from Pioneer to Yamaha to whatever your can think of. We are experts at Surround Sound Configuration and AV unit installs. Mesa is HUGE! With a population of 500,000 people there is a TON of flat TV's that need to be hung and surround sound systems that need to be installed. Well Mesa, we have you covered. Our expert Technicians and installers know how to service all models of TVs and AV units. We are experts at wiring any age of home or room. Rest assured that your Home Theater Vision will become a reality. Allow us to offer your the best TV hanging service in the Valley. We want to deck out your home and room so you can impress your family, friend and guests with the power of Video and Sound! Give us a call today or request a free estimate online! Man do we love Chandler AZ! Although not growing as fast as Gilbert, Chandler still is full of young families and of course people looking to have the best TV mounting services available. That's where we come in! With Chandler Arizona having a population of over 250,000 people - we realize that there is constant demand for flat screen TV hanging and installation services. Great. We are your go to source for all things home entertainment and theater. Give us a call today or request en estimate online. We can quickly service Chandler residents in no time! Located and operating out of Gilbert Arizona, we love to help our local residents with all their home theater and entertainment needs. If you just purchased a new flat screen TV and need some assistance, great look no further. We can promptly and safely help get your TV hung and installed the way you envisioned it! With Gilbert Arizona being a rapidly growing city, new developments and homes are being constantly added. With this there are new home theater rooms and families looking to enjoy their new spaces with maximum Video and Sound, and a whole heck of a lot of popcorn! So lets get you setup with the best TV installers in Arizona. Request an estimate or call us today! Live in Scottsdale Arizona? Need your Flat TV or Projector professionally installed? Perfect. We are your go to experts! We specialize in Home Theater Installations and also Flat Screen TV hanging in the entire Scottsdale areas. So if you a home theater room that needs some loving or maybe you bought a new TV or surround system but have no clue or no time to install it then look no further. We are Scottsdale BEST TV installation and Surround Sound Experts. Contact us for all your home entertainment needs. We can turn your home theater vision into a reality! Phoenix Arizona is the largest City in the Arizona Valley. With that comes lots of people and lots of flat screen TVs!! But don't worry, we have the team and man power to satisfy all you wall hanging needs! When it comes to your Home or Business entertainment needs, look no further! We are the leader in all things technology, especially when it comes to High Definition and 4K TV setups with speaker and surround sound wiring as well. We also specialize in installing flat screen TV for gyms, bars and restaurants across the Phoenix area. Nothing is cooler for your customers than having a really amazing entertainments set up! Mix that with DIRECTV service, and you'll be ready to blow your customers away! Contact us for all your phoenix home theater installation needs by calling us or requesting an estimate online. Tempe is an amazing city full growth and businesses. It also is home to over 170,000 people. Let TV Audio Mounting take care of all your TV hanging needs. We specialize in all TV mount types and know how to install fixed, tilted, swivel and hanging TV mounts for any home or commercial building. If you have a vision in mind, let us know. We have technicians that are certified to install, wire and hang your TV or Speakers wherever needed. One thing that we know is when you have a clean and professional TV setup not only are you happy but so is your family and friends, and if you own a business so will your customers! Contact us today for a free estimate!